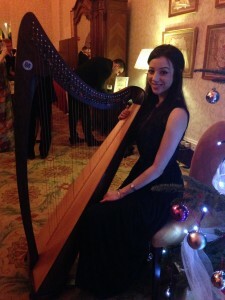 Often called the reception, drinks reception, or cocktail hour, I can be booked as a harpist or pianist for the arrival of guests at your wedding venue after the wedding ceremony. During this time, the wedding couple are often having photographs taken off site so it is a lovely time add some light entertainment for wedding guests. Alternatively, harp or piano music can be provided to accompany the wedding dinner. Perhaps you would like the elegance of classical piano, or maybe the ambience of the Irish harp. I play a mixture of popular & contemporary love songs, film music, light classical music, and beautiful Irish airs. A second instrumentalist can also be provided. For example, my lively Irish trad duo of fiddle & harp brings a room to life! I provide my own harp/keyboard and sound amplification equipment, or I can play the venue’s piano if there is one on site that is in good working condition. There is a reduced rate when you book a combination of services, for example, ceremony music plus drinks reception music. Contact me to see what I can do for you!